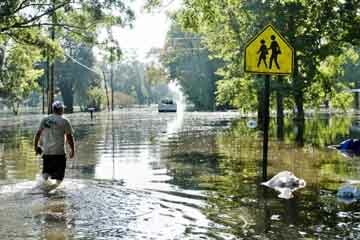 Lester Duplessis walks down a flooded street to his house on August 16 in Gonzales, Louisiana. Fresh from a two-week vacation, President Barack Obama visits flood-hit Louisiana on Tuesday, hoping to offer support to devastated communities and silence his critics. Obama has been lampooned for not cutting short his Martha's Vineyard holiday to visit the Gulf Coast state, where heavy rains have submerged thousands of homes. Republican presidential nominee Donald Trump visited flood-struck communities last week and goaded the golf-loving president about his absence. "Honestly, Obama ought to get off the golf course and get down there," Trump said. White House spokesman Josh Earnest on Monday defended the White House's response as "effective" and bristled when asked if Obama's visit was prompted by Trump: "Of course not," he said. "What the president's been focused on is the response on the ground and the people whose lives in Louisiana have been turned upside-down by this terrible flooding event," Earnest added. The Federal Emergency Management Agency reported that up to 31 inches (79 centimeters) of rain fell on some parts of the low-laying state-where the highest point is just 535 feet (165 meters) above sea level. Some 13 people have died and 86,000 have registered for US government emergency assistance as a result of the flooding. The disaster brought back painful memories of Hurricane Katrina, which 11 years ago inundated nearby New Orleans. Then, the federal government was pilloried for its slow response. Images of president George W. Bush looking out the window of Air Force One as he flew over New Orleans became emblematic of perceived government detachment from the crisis. For this month's floods, the National Guard has been deployed and the federal government has worked hard to show it is doing everything possible to speed the recovery. Obama has declared a major disaster in 20 of Louisiana's 64 parishes-the state's equivalent of counties-streamlining federal assistance. "The response that you've seen from the federal government has been effective," said Earnest. But a few months out from November's election, politicians' visits have inevitably become another talking point on the campaign trail. Prior to Trump's visit, Louisiana's Democratic Governor John Bel Edwards said he welcomed him to the state, "but not for a photo-op." "We hope he'll consider volunteering or making a sizable donation to the (Louisiana) Flood Relief Fund to help the victims of this storm," Edwards said. The governor has also provided cover for Obama, saying the president's trip should wait until he does not draw resources away from the flood response. Any presidential visit is a major security and logistical event. Democratic nominee Hillary Clinton has said she will visit later, in an implicit criticism of Trump. "I am committed to visiting communities affected by these floods, at a time when the presence of a political campaign will not disrupt the response," she said, while calling for donations to the Red Cross. Republicans usually win the state of Louisiana handily in presidential elections. The last Democratic presidential nominee to win there was Clinton's husband, former president Bill Clinton, in his 1996 rout of Bob Dole.